Three Moments is a solo performance consisting of three peaces, created in various places as an investigation of several techniques. The first part is the last choreography of Rodrigo�s, made in Bytom (Poland) and was first shown in Belgrade, in the Cinema REX. 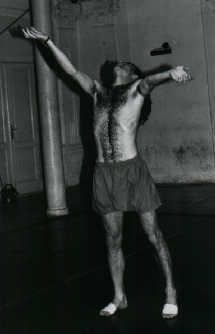 The second part is the fragment of the duet, performed in Brazil, and has been created in the spirit of the Buto Dance. The last part of this piece, also a duet, was created in New York City, where it was performed at the Dixon Place.